Michael Moran was the eldest son for Catherine Curley and Michael Moran who were married 9 March 1886. They had another daughter Mary Margaret Moran who was born on 12 July 1890. Mike had shot an 89 in the third round and left himself 14 strokes off the lead. It was to his credit that his final round was the best of the day and reduced the deficit by five strokes tying with Vardon in third place. He was 27 years of age and looked like becoming a formidable force in the golfing scene but the outbreak of World War I ended this. Michael “Dyke” Moran was born in a very small “one-roomed”, tin roofed cottage within the demesne of the Royal Dublin (“Dollymount”) Golf Club, in a place called Curley’s Yard (named after his grandfather Patrick Curley), located between the third and thirteenth holes. Like many professionals he started his life as a caddie who displayed a great aptitude for the game. Despite the fact caddies weren’t allowed play on the course he obviously was sneaking in some practice with “an old discarded iron”. During his early years he was referred to as Curley because of his grandfather. The grandfather was by all accounts a character of some renown and even had a treacherous bathing-pool named after him near the Bull Wall, “Curley’s Hole”. Apparently it took many a young life at the turn of the century and beyond and was immortalised in the poem ‘Gas from a Burner’ by James Joyce in 1912. Michael could be seen jumping the dykes that are on the course on his way home from the clubhouse and this may have resulted in him being re-nicknamed, Dyke, although others believe it was because his ability to score birdies from that particular hazard and colloquially the birdie was often referred to as a “Dyke” even into the seventies. In all likelihood he was christened the Dyke and later given his proficiency at making birdies the word entered the Irish vocabulary as a synonym for a birdie. Michael Moran started his professional career at Dundalk Golf Club but in June of 1907 became an assistant to Tom Hood back at Royal Dublin Golf Club and the following year was named as the club’s playing professional. Moran was very much in demand as a playing partner by the cream of Dublin’s society who made up much of the membership at the Dollymount golf club. This was around the time of the first attempts to organise the professional golfers in Ireland when the GUI was asked to oversee the professionals in 1906, which in turn led to the inaugural Irish Professional Golf Championship that took place in 1907. By 1909 he began his one-man dominance of this championship for five successive years after which he was appointed professional of Seaham Harbour in 1914. 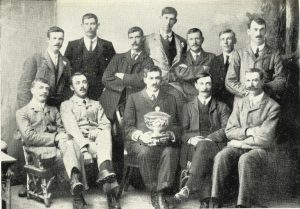 Prior to the 1907 Irish Professional Championship an open professional tournament was played which allowed the travelling Scottish international team, and others that may not have been eligible to play in the native championship, to compete. Moran won this by four strokes from Bertie Snowball with rounds of 76 and 78 taking the £10 top prize. In the international which followed he won his singles match against J. Donaldson by 5 & 4 but lost the foursomes when partnered with Alfred Toogood. Picture: The Irish International team who played Scotland for Springvale Bowl in 1907 prior to the inaugural Irish Professional Championship. Michael Moran – Back Row second from the right. Moran was often compared to George Duncan in the speed of his play and his temperament and was together with Lionel Munn considered the leading lights for Irish golf. Moran’s play was equally impressive when he played on foreign soil whereas Munn’s golf never translated as well away from home. He hit the ball very hard and moved quickly to the next shot assessing it en route. On the 6th July 1910 Portmarnock organised a professional tournament with a prize of £250 which attracted all the great professionals at the time with the exception of Braid, Taylor and Massy. There was a thirty-six-hole qualifier followed by matchplay stages for the top 32 players from the qualifiers. The start of the match was delayed as the motorboat that conveyed the players from the mainland to the peninsula broke down. Moran, partnered with Vardon, started the qualifiers badly with an 89 and followed up with an 80, the north westerly winds presented problems to a man of his stature. He only just scrapped through the qualifiers. He was scheduled to play Sydney Ball, the Wrexham professional, in the first round of the matchplay stages and after winning this he proceeded to play and defeat the leader of the qualifiers, Ted Ray. 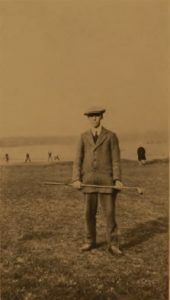 Moran was eventually defeated in the quarterfinals by George Duncan 2 and 1, who in turn was beaten by Vardon in the next round while the Stoke Poges professional Sherlock went on to defeat Harry Vardon in the final. During the 1910s there was a dearth of good quality Irish golfers either professional or amateur who had gained international recognition but Michael Moran was the exception and to a lesser extent Lionel Munn in the amateur ranks. While it was reckoned he had the skill to take the coveted claret jug his temperament would likely let him down. A mistake or misfortune was not something he could just brush aside and it would infuriate him. In 1913 at the Open Championship during the third round it was his temperament that resulted in him taking four to get out of the bunker. While not as fast a player as probably George Duncan he was still pretty quick by anyone else’s standards, a trait that seemed to describe the tempo of many of the successful Irish professionals including Harry Bradshaw, Christy O’Connor and Willie Nolan. Following this Michael Moran joined Braid, Duncan, Massy and Taylor amongst other to line out for the French Open Championship at Chantilly. Despite not playing well in the first two rounds (162) he recovered moving up ten places in the final two rounds to take twelfth place (and £5 in prize money) out of the 72 entrants which included the cream of British and French professional golf despite first prize being only one tenth of the PGA Matchplay tournament. It was just over 100 miles north of Chantilly where he would be finally laid to rest. 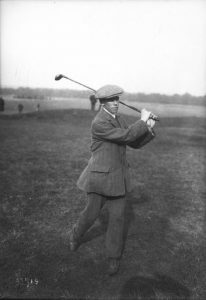 In 1914, Moran played an exhibition match on his home course at Seaham Harbour Golf Club against George Duncan and an in form Douglas Edgar. Edgar had beaten Harry Vardon by six strokes to win the French Open Championship at La Touquet. Darwin described Moran “as ..one of the most sparkling of our younger players” despite Edgar beating him by seven strokes but the fact he was only one behind Duncan backed up this claim. Nearly everybody who can be is in the army now, and that is why one no longer reports accessions to the ranks from among our distinguished players. But now and then a man we had over looked comes along and takes up the sword or gun, and such a one is Michael Moran, who for five years in succession, from 1909 to 1913, inclusive, was the winner of the Irish professional championship. He was born at Dollymount, near Dublin, and holds the record for the famous course of the Royal Dublin G.C., this club and course being looked upon practically as the headquarters of Irish golf. Just as Lionel Munn, now serving with the forces, is undoubtedly the best amateur golfer who has ever come out of our s i s t e r isle, so Moran is certainly the best of the Irish professionals, and t h e y w e r e hoping in Ireland that he would at last take the championship cup back to that country, when, alas! for Ireland, he left her two years back and took up a post as professional in the north of England. But, of course, Ireland still has her claim on him, and will watch his career eagerly when the present European war is over. For the time being he is a cavalryman, having enlisted in the South Irish Horse. Moran, as I know very well, for I have watched him very closely and have been referee in important matches in which he has been engaged, has enormous grit and a fine temperament, which he hides under a subdued demeanour, and he will make a splendid soldier of this kind. Good luck to him, as to all the others. I often think that no “outsider” ever came so near to creating a big surprise as Moran did in the Open Championship at Hoylake in 1913. On the night before the last day, with the championship half over, he was third in the list, and he was playing so well that his prospects of winning were very generally discussed. But in the morning he was one of the early s t a r t e r s and the weather that day, with a howling gale blowing, heavy rain beating in the faces of the players, and all the worst horrors of the elements in full activity, was really awful, Moran began by making a 10 at the very first hole, his ball passing from one bunker to another and needing three or four shots to get it out each time. From such a bad start recovery for championship purposes was practically impossible, but in spite of his nominal 87 for the round and the intense disappointment that it must have caused, he did a 74 in the afternoon, which was the best round of the day, and finished third in the list after all. There is the very best stuff in a man who can do this sort of thing. He was by all odds the greatest golfer in Ireland, and was looked upon as liable at any time to break in upon that wonderful combination of Vardon, Braid and Taylor in the British open championships. Tom Ball was another who, like Moran, George Duncan, J. G. Sherlock and one or two others, was rated as of championship timber. On the 5th August 1915 Michael Moran played Lionel Munn in an exhibition match at Galway Golf Club (“Barna”). The Galway Golf Club’s centenary book recalls a thirty-six-hole match between Moran and Mahoney, the local professional, in aid of the Red Cross. Moran borrowed clubs and completed the first nine in thirty-three strokes compared with Mahoney’s thirty-four but by the end of the first eighteen, Moran was five holes up. In the second eighteen Moran’s lead had been reduced to three by the fifth hole but Moran responded with three consecutive birdies to put the match beyond Mahoney’s reach and closed the match out at the twelfth. In 1911 Moran received an invitation to play in the George V Coronation Match, Amateurs vs Professionals at Sandwich on 24 June 1911, from James Braid as was Lionel Munn. He was partnered by Rowland Jones to play Munn and Mr H W Beveridge from Royal Cinque Ports and the amateurs eventually won on the 38th hole having halved in regular play. Other invitees to the Coronation Match were Braid, Vardon, Massy, Duncan, Taylor of the twenty professionals invited and Ball, Hilton and Chick Evans were some of the Amateurs. The Great War saw many gallant men die and Ireland was not immune from the carnage, along with Michael Moran, G. Boyd, the 1912 South of Ireland champion and Lieutenant Averell Digges La Touche paid the ultimate price. William Gibson’s research, in his seminal work on the history of Irish golf, identified that Moran joined the 7th Battalion (South of Irish Horse) of the Royal Irish Regiment, they travelled to France to play their part in the Great War. Private Michael Moran made his last trip back to Ireland in 1917 where he was photographed playing golf, in uniform, at Clontarf Golf Club. It is understood that the South Irish Horse disbanded in September 1917 which may explain is return to Ireland and is subequent change of regiment to that of the Royal Irish Regiment. At the time of his death his battalion was part of the 49th Brigade of the 16th (Irish) Division. It isn’t clear why he joined the war effort but he was still playing exhibition matches on behalf of the British Red Cross Society in August (Castle GC) and September (Clontarf GC) of 1915 at which time there was no mention of him having joined the armed forces. Many games were played around the golf courses of Ireland in aid of the war effort the two mentioned above coincided with Moran visit back to Ireland and he was no longer affiliated with any club. His game was still very much finely tuned for these matches. In the match at the Castle Golf Club eighteen professionals turned out with Moran (72) winning by seven shots from Pat O’Hare (79), the professional at Foxrock GC while at the same time producing a new course record. At Clontarf he shot a 73 losing by one shot to Pat O’Hare. The Dollymount Golf Club was now a base for musketry training and with all professionals struggling to make a living it may be that circumstances necessitated his enlisting in the army. Michael Moran, who for five years won the Irish Professional Golf Championship, has enlisted and is now a private in the South Irish Horse. He left Ireland two years ago to become professional at Seaham Harbour. Conscription to the armed forces was legislated for by Prime Minister Herbert Asquith in January 1916 for single men aged 18-40 years old and would not come into effect until March of the same year. Research by Colonel Bill Gibson uncovered evidence that he had military experience having joined the 3rd Militia Battalion of the Royal Dublin fusiliers albeit as a messenger for Tom Hood. It may have been the intention that Seaham Harbour (now Seaham Golf Club) would take him back as professional after the war as a T.Curley was recorded as having joined the club in 1917 as a professional. It may be only coincidence but Curley was the maiden name of his mother and he had an uncle Thomas to whom this may refer. J Roche-Kelly, LtCol. Comdg. 7th(SIH) Royal Irish Regt. takes up the story of how the division were involved in the Battle of the Lys (9th-29th April 1918). This was the part of the major spring offensive (The Kaisersclacht) by the German army who had been much strengthened on the western front by the collapse of Russia, enabling them to transfer many Divisions to the Western Front. He must have been on the frontline when the battle started as it was recorded that he died of wounds, not long after the start of the Kaisersclacht. Le Cateau was in an area controlled by the Germans until Oct 1918 and he was effectively a prisoner of war when he died, and was buried by the Germans at Le Cateau, an important German Hospital centre. He died on the 10 April 1918 at the War Hospital Le Cateau and was buried at Le Cateau Military Cemetery Grave I. B. 32., after being fatally wounded in battle, while the hospital was still in German hands. [Pte. Michael Moran 25619 Royal Irish Regiment previously 1838 South Irish Horse]. Click here for more information about Le Cateau Military Cemetery and here for a picture of his headstone at Le Cateau Military Cemetery. In his honour the Michael Moran Cup was inaugurated in 1920, open to Irish professionals, the winners are a veritable who’s who of Irish golf. During the early 70’s the competition reincarnated itself into a fourball format after it was cancelled in 1969. However the competition ended in 1979 due to lack of a sponsor, the Cup was resurrected again and is still played for today. The fourteenth hole on the Royal Dublin Golf Links is called Moran’s in his honour. The arboretum which is now his resting place can be partially viewed (Google Maps) North-East of Paris where the N43 and D932 converge near the town of Le Cateau-Cambresis. Maybe it’s time they brought this Fleur de Lys home. The National Archives of Ireland published Soldiers Wills and Michael Moran Nuncupative was included at click here. In reply to form enclosed I beg to state (1) That I saw the Will (2) I saw and read the Will Not sure of date but I think it was 17 August 1917. At late address 39 Bayview Avenue, Sth Strand, Dublin (3) The exact words As near as I can remember are: I hereby leave my personal effects and belongs to my sister Mary Dowling 39 Bayview Avenue, Sth Strand, Dublin. (4) The Will was written in his army pay on the form which was in the pay book which was a dark covered pocket book (5) His Uncle Thos. Curley 15 Swallow St. Yorkshire (since deceased) saw and read the Will (6) Michael Moran 62 Ballybough Rd. Dublin father of Acting lance corporal M. Moran and Thos. Curley 15 Swallow St. Yorkshire Uncle of Acting lance corporal M Moran. In my opinion, knowing Moran (Lance Corporal Moran’s Dad) for a number of years the statement made by him may be taken as truthful & correct.